Financial technology (fintech) continues to play a significant role in many positive changes we experience in the sector. With the growth of the financial industry, many existing and new businesses have not been left behind. Most of them use one or more fintech forms in their daily commercial operations. But, even as adoption of the tech continues to widen, users still face some fintech challenges. According to the infographic below by Carsurance, some of its popular disruptions include internet banking, mobile banking, digital money, blockchain and cryptocurrencies, to name a few. 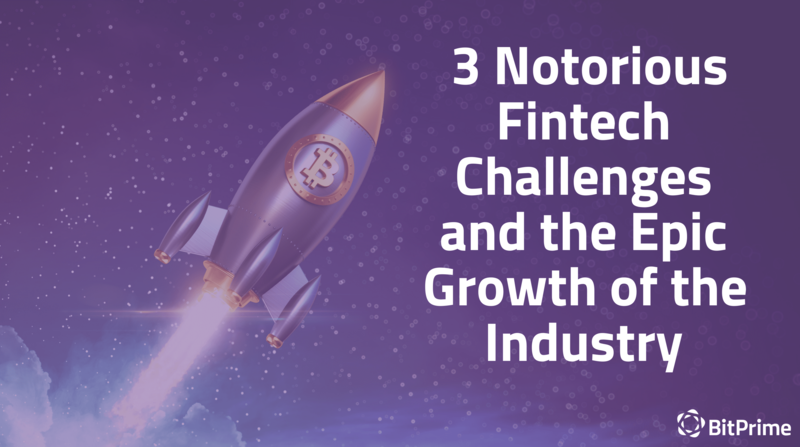 In this post, we’ll analyse three of the most notorious challenges in the fintech space and take a look at the evolution of the fintech industry. Insecurity has always been a big challenge when it comes to technology. Fintech-based businesses have been some of the worst affected in recent times. Every day, cybercriminals find more sophisticated ways of perpetrating their acts, sometimes rendering the affected businesses total failures. Take, for instance, various cryptocurrency exchanges that have been hacked in the past, leading to the loss of millions of dollars in investor funds. Such cases are reasons that hinder the cryptocurrency sector from realising its full potential. Firms need to put in place adequate control measures, educate users, and invest heavily in their teams to build skills in accordance with the current market safety practices. Smaller businesses find it challenging to implement the ever-changing regulations in the technology sector. But what is even more challenging is complying with varied global standards, especially for the multinational companies. While their larger counterparts may get through easily, smaller firms have minimal resources that may bring about serious compliance issues. To that effect, firms must involve themselves in the activities of the regulators to set achievable and mutually beneficial rules and regulations. Also, fintech firms should consider teaming up with other firms to enjoy economies of scale. Fintech has been described by many as the ultimate disruptive force in the finance sector. Hence, adding a human touch in its development and implementation will undoubtedly make the technology more acceptable to consumers. Financial businesses need to invest more in AIs and machine learning if these systems are to resonate better with humans. Moreover, companies that don’t have human touch in their technology are prone to IT meltdowns, pretty much like the one that occurred with TSB (UK bank, not NZ's Taranaki Savings Bank) leaving hundreds of customers without access to their accounts. To avoid these and more issues, fintech companies need to put in place more consumer-focused systems. This will improve the consumer experience, which should be the ultimate goal of every business. In conclusion, each and every form of technology has its own challenges. While they may sometimes result in more significant problems, fintech companies need to invest heavily in research and development to devise better techs geared towards consumer needs. Infographic made by our friends at Carsurance.